Dr. Cooley deserves thanks and great credit for doing this research on ACell… he is one of the few HT doctors who has shown he really cares about alternative treatments, by taking the time to do this research when he could be using that time for profitable HT surgery. However, something tells me this won’t amount to much in the end, and I think even Dr. Cooley questions whether it will be successful. As Spanish Dude has mentioned, it is likely that the new hairs won’t cycle, since they grew only from plucked hairs, not from the entire follicle. I think before we all get excited here about this, and add 11 million posts to yet another ACell thread, we should consider this and not get our hopes up. People are excited because a Follicle develops around the hair. Don’t you think that’s impressive? These so-called “new” follicles develop around the donor hair follicle which has been plucked? Are these results reproducible? Does it happen every time? Do they result in thick, terminal hairs or only small vellus hairs? » he could be using that time for profitable HT surgery. » grew only from plucked hairs, not from the entire follicle. A life-cicle of an hair is long 3 YEARS. This means that if you have a 15.000 UF transplant, you can have 15.000 hairs for 3 YEARS. And you’re not happy for this. Who says the hairs will even last for 3 years? You’re forgetting that there’s a realistic THIRD alternative, which is that the hairs are weak and either fall out or turn into vellus follicles well before the 3 year mark. The likelihood that they fall out much sooner than 3 years is very real. Besides that, there’s a good chance that you won’t get that high a yield – 15,000 new follicles from 15,000 implants. Remember, we’re talking about plucked hairs. Who says these plucked-hair implants have a 100% yield, and that 100% of the implants produce cosmetically good terminal hairs? I sure haven’t seen hard evidence of any of that. I’m not trying to doubt Dr. Cooley’s research here – but I think he’d be the first one to say that we don’t really know these things yet. You are acting like you DO know all these things. How do you know? Tell me where you got your degrees in Cytology, Trichology, Medicine, etc. And anyone who wants to refute anything I’ve said here, please just refute it with normal arguments, in a decent way, without ad hominem attacks. Just because I doubt these things doesn’t mean I’m attacking HM or doubting the whole concept. I just see a lot of people believing a lot of things wholesale, without proof, and wearing blinders when it comes to valid and legitimate contrary arguments. » » he could be using that time for profitable HT surgery. » » grew only from plucked hairs, not from the entire follicle. » A life-cicle of an hair is long 3 YEARS. » hairs for 3 YEARS. And you’re not happy for this. Can anyone explain the difference between this procedure and the one which is done in Holland by dr. Gho? He basically takes hairs from the donor area and transplant them in balding areas. The hair in the donor area grows back. What is the extra advantage of the Acell/Cooley procedure? Sorry if this is discussed before but I cannot seem to find the real exciting difference between the two. Besides the FACT, that currently they (Cooley/Hitzig) are more than 5 years behind Dr. Gho. » years behind Dr. Gho. 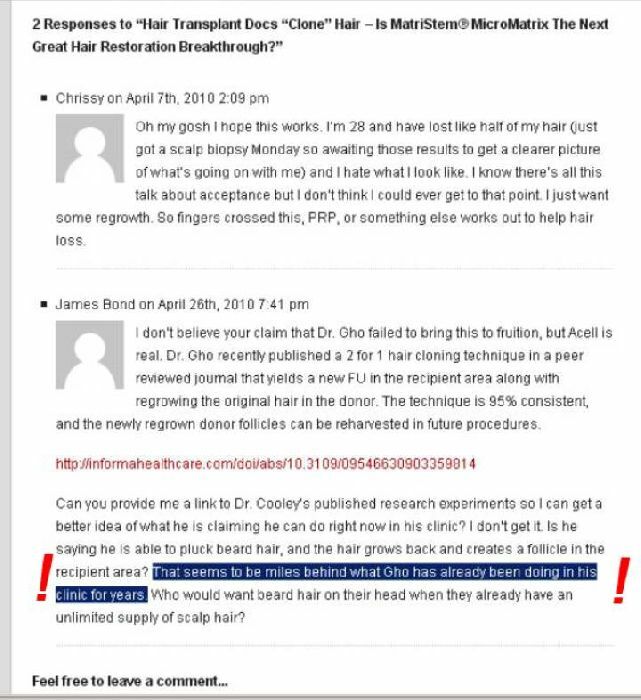 Uh, well aside from the fact that Cooley’s method uses Acell and we have biopsy photos that show that at the microscopic level basically what is a dead hair regenerates into a healthy, functioning hair follicle. Just y’know … a minor difference, lol. » dead hair regenerates into a healthy, functioning hair follicle. » Just y’know … a minor difference, lol. Actually, I already tried to explain this subject (Dr. Gho’s vs. Dr. Hitzig’s technique) in detail - do you remember? » » dead hair regenerates into a healthy, functioning hair follicle. » » Just y’know … a minor difference, lol. 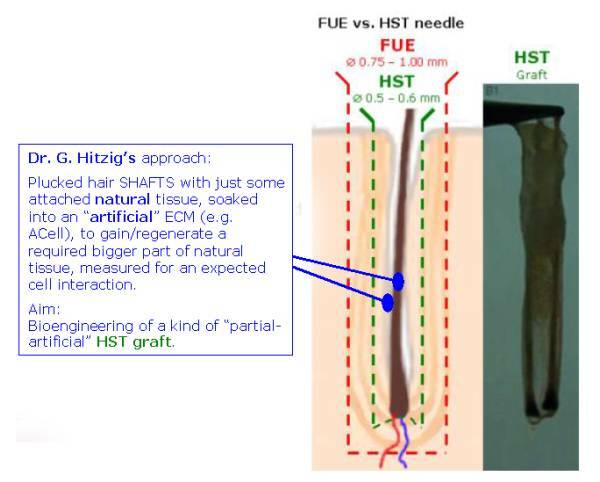 » Actually, I already tried to explain this subject (Dr. Gho’s vs. Dr.
» Hitzig’s technique) in detail - do you remember? Really who really cares who brings this to the market? I don’t give a f-ck as long as it works and to be honest I’m sure you’re all nice people, but I don’t give two craps about being “right” or “wrong” on an internet message board full of people I’ll never meet (or probably really even care to meet) in real life. I don’t give a crap about Gho or Cooley as people either, as long as they give me a procedure that works, then my money given to them for a working procedure is thanks enough. That said, Acell isn’t just any kind of ECM, it has Laminin 511 which Stanford researchers linked to hair growth/regeneration last year. This is why I always thought there could be something to Acell, it just needed to be put in the hands of someone who would try it out in a variety of ways. Ironman, I am not too familiar with Gho’s method…but doesnt he surgically remove part of a follicle and try to leave enough “remaining follicle tissue” so that it regrows another donor hair in the area where the partial follicle was removed ??? If thats the case then it sounds similar to Cooleys technique, but in some ways much different…your are relying on his ability to extract the necessary sections of the follicle to support regrowth in both the donor and recipient areas. And is an ecm used at all in his technique ??? Cooleys seems much easier as far as the plucking procedure and pretty much guarantees regrowth in the donor region. Also I thought it was the Acell product attracting stem cells to the plucked hair shafts tissue in the recipient area that allows new complete follicle formation ??? Dr Gho is transecting follicles at a very specific point and looking for the donor area to regrow itself whilst the transected part that is taken out is then supposed to grow in the recipient area. Aside from his study Dr Gho seems so far unwilling to document this. Drs Hitzig & Cooley are just plucking hairs (which as we know will normally then regrow) and then coating the plucked hair in ACell - which he then transplants into the recipient area. Dr Cooley says with donor head hair this will grow in the recipient area 50-75% of the time (and this figure he thinks he can still improve upon). In procedural terms I do not see these two operations as similar at all - the Hitzig/Cooley procedure is I think much easier to do. Roger_That you seem incredibly negative about this development, personally I think it is extremely exciting (for all, including HT professionals)- although I do understand that in the short term this will be a worry for many HT doctors who would prefer to retain the status quo - perhaps THIS is your concern ? Just so we’re getting “just the facts”, you should probably point out that even Spainish Dude has taken back his comment about hair cycling because he didn’t properly understand the interview the first time he heard it. Also Cooley doesn’t question whether or not the procedure will be successful, just that he doesn’t want to make claims right now that are untested (ie: he is testing the cycling issue, but this takes time to do). » Gho seems so far unwilling to document this. » figure he thinks he can still improve upon). » the Hitzig/Cooley procedure is I think much easier to do. first of all, excuse me if I pose some stupid/obvious remarks, but I am not as informed as most of you guys. It seems to me that both procedures are basically the same. Gho is transecting follicles from a donor area to a balding area. In the donor area the hair will regrow and the transplanted hairs will grow as well. His procedure is very much mainstream in the netherlands and many people have undergone this procedure. » » Gho seems so far unwilling to document this. » » figure he thinks he can still improve upon). » » the Hitzig/Cooley procedure is I think much easier to do. » » your concern ? » netherlands and many people have undergone this procedure. Did the hairs Gho transplanted grow a new follicle around them? The Gho and Cooley procedures are not the same at all. First off not using Acell is a massive difference. Without Acell none of this works at all to begin with most likely. That’s like saying an obese 300 pound woman and a Victoria’s Secret model are the same because they’re both female. Well yeah … ok … the details are a little different though. They aim to do a similar end result, but in very different ways. » begin with most likely. » are the same because they’re both female. » to do a similar end result, but in very different ways. The procedures may not be the same, but the claimed results are! Gho is already performing the procedure so it is possible to have it work without Acell. If Cooley claims more then just transferring hair from donor area to balding area with full recovery of donor area, then i stand corrected. Skywalker, do you know how long Dr Gho has been transecting follicles? SINCE 1996, at least. That was when the first article about Gho appeared in the Dutch media, in the De Gelderlander newspaper to be exact, which actually prompted the first forum on Hairsite concerning Hair Multiplication. Gho was doing follicle transections long before he did anything with cells, stem or otherwise. It’s now been almost 15 years, and nothing? Not one person ridden of MPB and restored to a full head of hair, or nearly a full head, by Gho, or by any other doctor who might have wanted to take up his work? I mean, for such an allegedly simple and straightforward concepts, it shouldn’t be rocket science to bring this research to completion and get going with a workable procedure…THAT IS, if it were even possible. I’m not saying it’s impossible necessarily, I’m just saying that common sense dictates, at this point, LONG after research on this exact concept of transecting follicles started, that it is highly unlikely that some doctor will miraculously find the “sweet sport” on the follicle, say 0.008 nanometers to the right of the 33rd dermal papilla cell, where he has to cut, in order to make this procedure work, and reliably grow new hair.